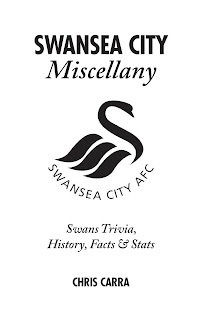 My second book, the Swansea City Miscellany, is now available from all good bookshops, online, and direct from the club shop. 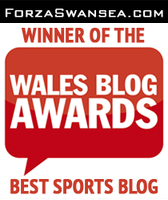 Visit the official Swans website for more details on the launch. If you're around the stadium, please pop in and say hello! 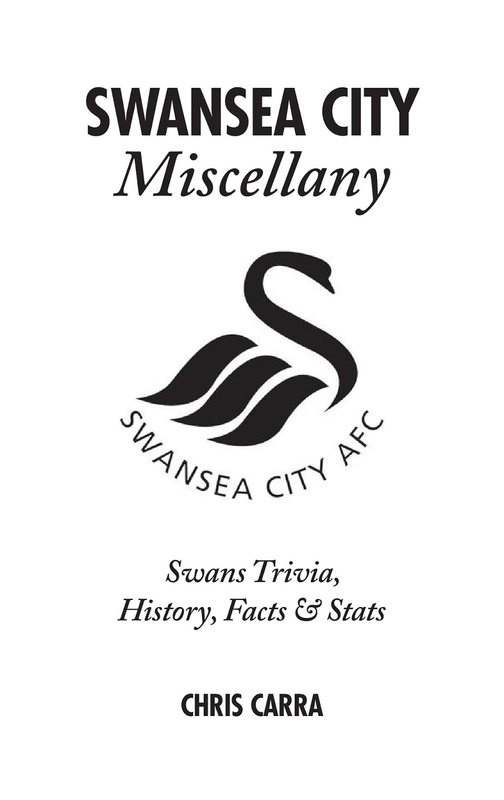 Welcome to the long-awaited announcement of my new book, the Swansea City Miscellany! After the success of Swansea City's Greatest Games last year, I decided it would be fun to tackle an equally challenging project, although in very different ways from the first book. What the hell is a miscellany, you ask? Essentially it's a little encyclopedia of everything Swansea City; club history, player profiles, top ten lists and unique records, along with funny stories and memorable trivia, all rolled into one easy-to-pick-up read. The kind of book that would be a great friend on a long train journey or a short bathroom break. Our genius chairman Huw Jenkins has contributed a foreword to the book, while there are some excellent nostalgic photos throughout. The Miscellany will be available from the start of next week, although you can pre-order it on Amazon. However, as a Swansea City fan, I recommend you purchase it directly from the club shop as the club will benefit from the sales. A signing at the Liberty Stadium club shop and Waterstones will be announced very soon. It's September - that means autumn is summer is pretty much over. However the sun is actually shining, and this is probably the only time you'll be able to enjoy an iced coffee all year. You sort out the coffee, I'll sort out the writing, and we'll meet back here in five minutes... GO! There's been no Swansea City action this weekend, but a handful of first team Swans have been playing for their countries over the past few days. Ashley Williams and Neil Taylor both featured in Wales' crucial 1-0 win against Cyprus on Thursday, with Williams putting in one hell of a shift - definitely the Dragons' star player. Gylfi Sigurdsson scored from the spot in Iceland's surprise 1-0 victory against Holland, while Jonjo Shelvey featured for England in their predictable 6-0 blitz of San Marino last night - making him the very first player to feature for England while playing for Swansea City. And it was a good performance, showing off the best of his passing game. Definitely one to show Roy he's not a one-cap wonder. One of the biggest surprises of the transfer window was Nathan Dyer making a loan move to Leicester City for the rest of the season. It's not gone completely to plan for Dyer over the past few years. While he certainly made the step up to the Premier League - wowing in some games - he failed to consistently deliver, and has recently lost some pace and confidence. And with an abundance of talent available on the wings these days including Montero, Ayew and Routledge, Dyer will be much more likely to pull on a Leicester City shirt than a Swansea one. Who knows - he may find his Championship form again and be a big part of Swansea's future. We all hope so. But for now, thank you Nathan and see you next year! The next 20 names are set to be added to Swansea City's Robbie James Wall of Fame, on the external wall of the Liberty Stadium ahead of the Everton game on Saturday, 19 September. There are some huge names on there - players that made a great difference to Swansea as both Town and City, such as Harry Hanford, Reg Weston, Jimmy Rimmer and Leighton Phillips. If you don't recognise the names you need to do some reading - get yourself a copy of Swansea City's Greatest Games! The following 20 players' names will be fixed to the wall: Jimmy Collins (1919-30), Alex Ferguson (1927-35), Harry Hanford (1927-36), SJ Lawrence (1930-39), TB Olsen (1930-39), Trevor Ford (1946-47), Reg Weston (1946-52), Frank Burns (1946-52), Tom Kiley (1947-57), Alan Williams (1968-72), Des Palmer (1950-59), Ray Daniel (1958-59), Mike Johnson (1958-66), Brian Purcell (1958-68), Brayley Reynolds (1959-64), Dai Davies (1969-70,1973, 1981-83), Jimmy Rimmer (1973-74, 1983-86), Leighton Phillips (1978-81), John Mahoney (1979-83), and Dave Stewart (1980-81).